A report released by the World Bank projects no economic growth in Russia either in 2015 or 2016. This forecast is at odds with the figures from the Russian Ministry of the Economy, which predicts an economic growth of 2.3 percent as early as in 2016. At the same time, the World Bank has approved of the decision to allow the Russian ruble to float in late 2014. 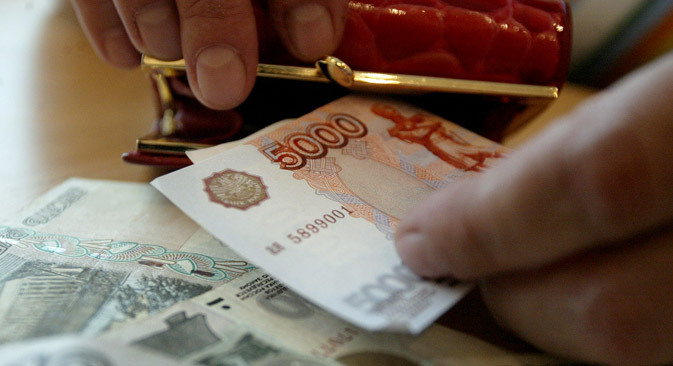 Russia will see no economic growth in 2015-2016, according to a World Bank report published on the organization’s website. The bank attributes the recession in the Russian economy to a drop in private investment and projects a significant slump in GDP as a result. According to the report, Russian GDP in 2015 may fall by 2.9 percent in an optimistic scenario and by 4.6 percent, in a pessimistic one. In 2016, the economy will grow by 0.1 percent in the best-case scenario, while negative circumstances could lead to a 1-percent fall in GDP. One of the main factors that will determine which scenario will be realized is the oil price, warned the report’s principal author Birgit Hansl, World Bank Lead Economist for the Russian Federation. “The impact of the main shock, the slump in oil prices, only began to affect the economy in the final quarter of last year, and the impact is likely to be more profound in 2015 and 2016,” said Hansl in the report. For the positive scenario for 2016, oil prices should reach $68.7 per barrel; for the negative, $50. This forecast is significantly at odds with the figures released by the Russian Ministry of the Economy, which expects the country’s GDP to grow by 2.3 percent as early as in 2016. Experts attribute the difference in the forecasts to excessive optimism on the part of the Russian authorities and a difference in approaches. According to UFS IC chief analyst Alexei Kozlov, Russian officials’ outlook is more positive than forecasts from international institutions, though overall their forecasts are broadly similar. “Inflationary pressure and the rising cost of borrowing are having a negative effect on the country’s economy,” says Kozlov. In particular, the value of the ruble is largely driven by oil prices since the link between these two factors reflects Russian budget revenues. “Economic growth forecasting is indeed made more difficult by the Russian economy’s strong dependence on changes in oil prices,” agrees Finam analyst Timur Nigmatullin. Another reason for the discrepancy between forecasts lies in differing assessments of development in the key sectors of the Russian economy, explains an associate professor with the Finance and Banking Department at the Russian Presidential Academy of National Economy and Public Administration, Vasily Yakimkin. According to Yakimkin, given the GDP drop of 2.1 percent in January 2015 and the 3.6-percent drop in February 2015, the Russian economy will shrink by 7 percent for 2015 as a whole. “Capital flight will increase, the ruble will fall and there will be a local surge in inflation, which, taken together, will add up to a recession,” says Yakimkin. Therefore, he continues, there can be no talk of economic growth in Russia in 2016, if only on the basis of an analysis of global trends. According to the World Bank, the problems in the Russian economy are of a structural nature. In particular, between the late 1990s and 2013, investment in Russia grew slower than in other world economies. As a result, the World Bank’s base scenario also envisages a rise in poverty levels from 10.8 percent in 2013 to 14 percent in 2015, and 14.1 percent in 2016. Finexpertiza deputy managing director Stanislav Safin argues that the restrictions on food imports from the EU and the U.S. introduced by the Russian government earlier in 2014 also played a role in limiting the damage to the Russian economy. “Despite their mid-term ambiguity, these decisions by the government do give serious support to domestic manufacturers,” says Safin. According to Timur Nigmatullin, a cheaper ruble and Russia’s countersanctions have had a positive effect on GDP dynamics. However, Vasily Yakimkin points out, a weaker ruble has been of help only to sectors of the economy that were not laden with debts and that relied exclusively on domestic demand, like the petrochemical sector for example. In the agricultural sector, on the contrary, the low value of the currency has provoked a hike in prices.